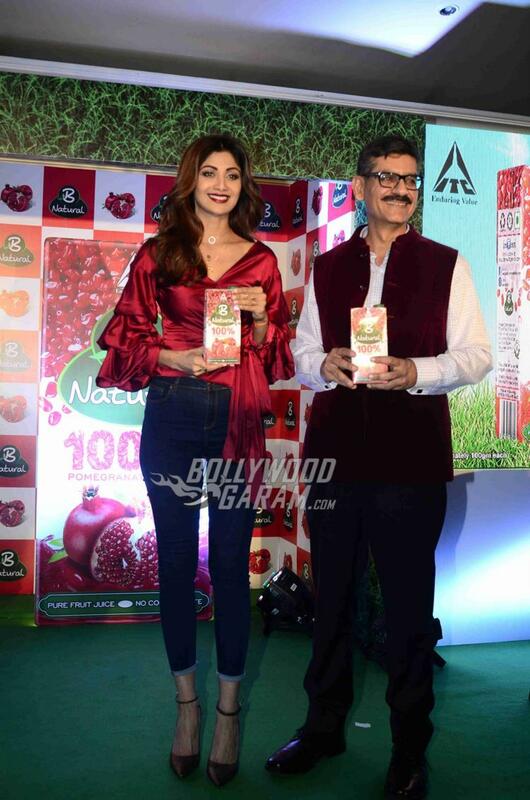 Actress turned fitness diva Shilpa Shetty Kundra has been roped in as the brand ambassador for B Natural Juices and Beverages. The actress and entrepreneur graced the launch event in Mumbai on April 10, 2017 as she launched their pomegranate juice. Shilpa looked stunning in a Marsala satin wrap top with dramatic sleeves and a pair of denims. The Dhadkan actress has never disappointed the fashion critics and completed her look with matching heels, simple hair and minimal make-up. Shilpa, at the launch, said that the brand has taken a new step towards educating people and helping them to make a choice towards a healthy lifestyle. Shilpa Shetty herself is committed to a healthy lifestyle, and is slowly becoming the health powerhouse of the country. Last month, she launched her own wellness website, TheShilpaShetty.com and also became the new brand ambassador for Yakult, a different kind of health drink. On the work front, the actress has been busy with various business ventures and has also been active in promoting fitness. The Phir Milenge actress was last seen in the movie Dishkiyaoon that she had co-produced and appeared in the song Tu Mere Type Ka Nahi Hai.